VegeGreens Multi features a complete array of over 90 foundational nutrients, including the entire spectrum of vitamins, minerals, antioxidants and support nutrients in our MultiVitamins, along with the land, sea and cruciferous vegetables, green food concentrates, plant oils, pre and probiotics, digestive aids and herbal co-factors in VegeGreens. The nine botanical families in VegeGreens are Green Food Concentrates, Sea Vegetables, Land Vegetables, Cruciferous Vegetables, Essential Fatty Acids, Phytonutrients, Standardized Herbal Co-factors, Digestive Support and Fibre. Now there is no excuse for not taking your vitamins or eating all your fruits and veggies! All in 1 convenient scoop! The critical role that plant foods play in our diet cannot be overstated. Yet very few of us consume the recommended number of daily servings. Thanks to PhytoBerry Multi and VegeGreens Multi, that mission just got a whole lot easier. A single scoop provides the nutritional density of 6-8 servings of fresh fruit or vegetables, along with over 30 additional vitamins, minerals and support nutrients. In combination, they offer an unbeatable one-two punch that provides an almost endless list of isolated, botanical and trace nutrients. Now there is no excuse for not taking your vitamins or eating all your fruits or veggies! While both supplements offer tremendous benefits on their own, they are specifically designed to be used together. Fruits and vegetables may appear to make similar nutritional contributions, but they are in fact quite different. They also digest in conflicting ways so it’s best not to consume them at the same time. While PhytoBerry Multi and VegeGreens Multi can certainly be taken individually, the most complete strategy includes a serving of each taken at different times of the day. 1. Consume 1 scoop of PhytoBerry Multi as directed first thing in the morning. 2. 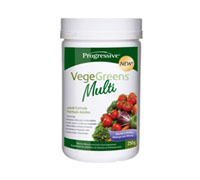 Consume 1 scoop of VegeGreens Multi as directed in the late afternoon or early evening.